The 135-room Comfort Inn Highway 290/NW is close to the Childrens Museum of Houston, Rice University and the Sam Houston Race Track and provides affordable accommodation for both the business and leisure traveler. Items included with the room rate are an expanded continental breakfast, high-speed wireless Internet access, local telephone calls, parking and coffee available in the lobby 24/7. There are three meeting rooms available for business or social functions that can accommodate 50 guests. Area landmarks and attractions include several golf courses, Cy-Fair Community College, Reliant Park, the Space Center, Houstons museum district, the George R. Brown Convention Center and shopping at Willowbrook Mall and The Galleria. All the rooms have a work area with high-speed Internet access, television with cable movie and news channels, tea and coffee making facilities, iron and ironing board, hairdryer and telephone with voicemail and dataport. 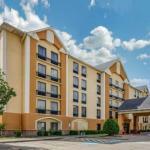 Non-smoking rooms and handicap accessible rooms are available. This hotel has a large outdoor swimming pool and provides passes to a nearby Bally Total Fitness Center. There is a Lubys restaurant and Mambos Seafood restaurant adjacent to the property. The 24-hour front desk has information on area events and attractions. Other amenities include a business center with copy and fax machines available for guest use, a guest laundry, daily housekeeping and ice and vending machines.